This x-ray is of a very happy lab named Adi. 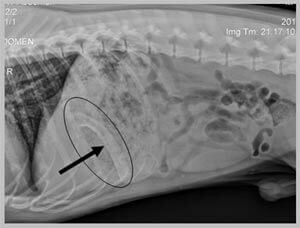 Adi recently ingested a rib bone (see arrow above) and was seen at Dove Lewis Emergency Animal Hospital for an examination and x-rays. Her owner was sent home with instructions to not feed Adi for 24 hours then repeat x-rays to see if the bone had moved or changed position. A follow up x-ray done at Parkway revealed that unfortunately the bone was in the same place. Adi was anesthetized and underwent an endoscopic procedure to see if the bone could be removed without surgery. Luckily for Adi, the bone was in a perfect position for Dr. Haley to retrieve, which prevented Adi from having exploratory surgery. 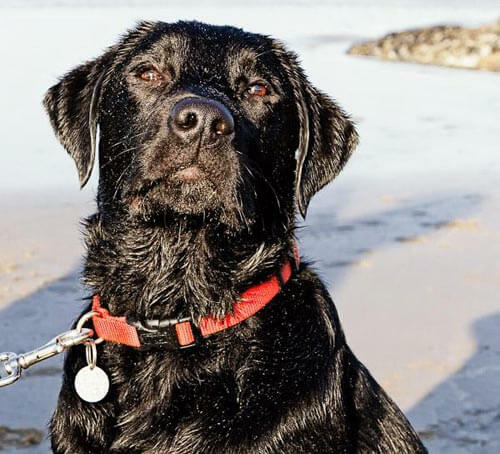 Because of Adi’s great outcome, she is this month’s Pet of the Month.